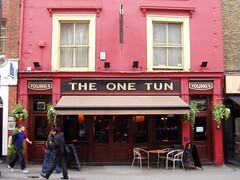 Young's pub in Fitzrovia. Was in the 2007 Good Beer Guide but not the 2008 one. It seems to have been refurbished during 2007. The seating is comfortable, with separate booths surrounding the bar, which is in the middle of the pub and faces both sides. There are also some tables at the back. The bar staff are perfectly friendly, though as a central London pub the faces tend to change fairly often. There are six handpulls, three on either side of the bar, with the usual Young's ales on tap (ordinary and Special), as well as Deuchars IPA on a March 2009 visit (£3/pint). There's a reasonable but short wine list of which, in January 2008, Ewan sampled the rioja (the most expensive wine at around £15) and the house red, a French wine (at about £11), both of which were eminently drinkable. We only got some chips on the January 2008 visit, but their crunchiness and texture was positively remarked upon. The food menu is fairly basic, with only five or six regular offerings and some specials. The Young's website lists food hours as noon-3pm daily, and 6pm-9pm Monday to Thursday. A friend reports they do good karaoke on Saturday evenings. They also have a board outside advertising a pub quiz on Tuesdays from 8-10pm. Last visited by Ewan and Sarah, 2 March 2009. Opening hours and food details taken from the Young's website, January 2008. Prices verified at the visits as noted above. Last edited 2013-06-05 14:05:49 (version 20; diff). List all versions. Page last edited 2013-06-05 14:05:49 (version 20).